Frankincense resin from the species Boswellia Sacra. This frankincense is traditionally and carefully harvested from organic mature trees in the Salalah region of Dhofar, Oman. This is a region where the frankincense grade is considered so high, it was specially set aside for royalty. Carefully hand sorted for colour. The rarest and most potent of all frankincense, this translucent green resin overflows with fresh hints of lime and menthol. 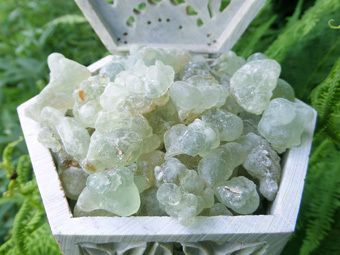 A very light and airy resin, perfect for relaxation, meditation and gently scenting your home. Long used in aromatherapy as a mood enhancer, a recent study carried out by researchers at Johns Hopkins University found that, when inhaled, pure frankincense smoke activates poorly understood ion channels in the brain. These are closely associated with emotion. This activity stimulates the production and release of TRPV3 – a protein which helps reduce anxiety and symptoms of depression (Moussaieff et al., 2008).